ST. ROSE, La. – Sally Meredith’s reading class looks different from most at Albert Cammon Middle School in this suburban town perched on the Mississippi, upriver of New Orleans. 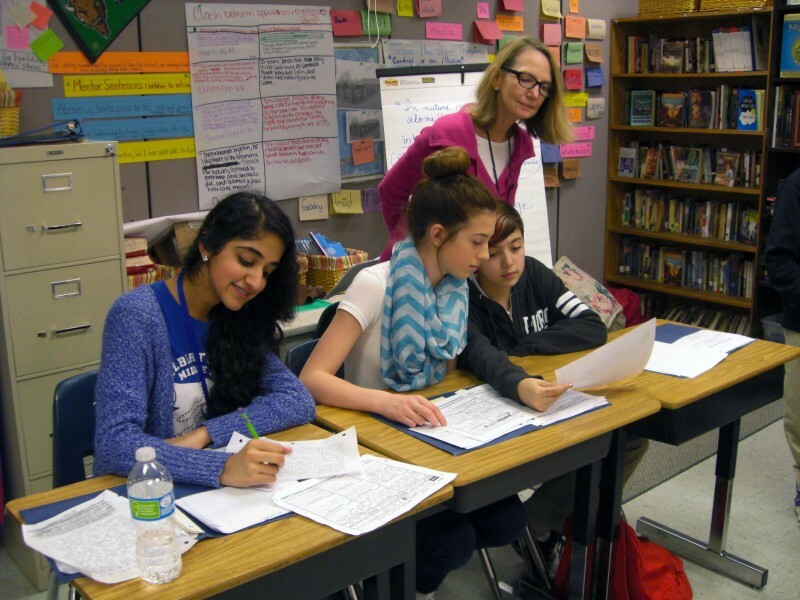 Meredith, an eighth grade teacher at the school, doesn’t spend her fifth-period reading class helping her 13-year-old students through difficult passages or having them read aloud, instead she largely lets her students take charge in debates over questions she poses to the class or leaves them alone to work on projects. Today, Meredith divides her nine students into two groups and asks each to play a part in mock negotiations over whether the NFL should continue to have their jerseys made in Vietnam. Over at one table, Donielle White, an eighth-grader playing the role of a Vietnamese factory owner, demands that her classmate Ian Carbo, who is playing the part of the American executive, agree to pay for factory upgrades. “How do you expect such high quality products from a developing country and are not willing to pay for it?” she insists. The other group is more conciliatory. Kai Hart, playing a less aggressive American executive, asks his classmates to consider that the people most affected by their decisions, child laborers, don’t usually have a voice. Meredith’s class isn’t different just because of her instructional style. In this school, where black and Hispanic students make up nearly 65 percent of the student body, Meredith’s has a different demographic – about evenly split between white and non-white students. The eighth graders are part of an experiment aimed at increasing the number of black and Hispanic students in gifted classrooms. Some students have passed the district’s gifted tests, but others are in Meredith’s class because teachers believe they have the potential to eventually pass the tests, if given enough nurturing and encouragement. In many American schools that house gifted and talented classrooms, there’s often a clear racial and economic divide between the “gifted” students and the “regular” students who make up the rest of the student body. In 2012, when the U.S. Department of Education last estimated the demographics of gifted programs, Hispanic students were underrepresented by 36 percent in gifted programs and black students by 47 percent. The division has prompted complaints about systemic discrimination and even lawsuits, and driven districts around the country to experiment with ways to include more students of color in gifted education. But efforts to fix this have fallen short: black and Hispanic students remain significantly underrepresented in America’s gifted classrooms. The gifted classrooms at some St. Charles schools are an exception, however, and the school district’s new way of identifying and singling out bright students may hold the answer for other places seeking to make gifted and talented education more equitable. St. Charles began its efforts to improve minority participation in gifted and talented programs in much the same way as countless other districts, focusing on how to remove one of two potential roadblocks in the way of qualified minority students – biased teachers or biased tests. Teacher bias was studied in 2005, when a team of researchers gave 207 elementary school teachers vignettes about a student with gifted traits and asked them to decide whether the student should be considered for accelerated classes. A third of the teachers were told the student they were considering was white, a third were told the student was black, and a third weren’t told the student’s race. Teachers who believed the student was African-American were least likely to recommend accelerated placement. In 2007, St. Charles Parish Public Schools began giving gifted screening tests to all second and eighth graders to avoid the possibility that teacher prejudices could influence who was considered for gifted classes. The change came with some success, but the district wasn’t satisfied. Complaints about biased tests have plagued gifted and talented programs for decades. Academics argue that tests used to identify gifted students disadvantage students of color and are unable to ascertain all the traits experts link to giftedness. The tests are a better indicator of fluency in English and American culture than intelligence, they say. But arguments about the efficacy of these tests are moot in Louisiana. State regulations require that districts rely heavily on standardized tests to identify gifted students. To be labeled gifted in Louisiana, by and large, students must score at least two standard deviations above the mean on a standardized reading and math test chosen by the district or on an intelligence test (two standard deviations above the mean translates to a score of 130 on the IQ test and is near the 98th percentile). Louisiana’s gifted law recognizes the limitations of these tests, particularly for poor and minority students. The law states that “few, if any, standardized tests “adequately control for the effect of such factors as environmental impoverishment, cultural differences, or the lack of opportunities,” making it “imperative” that such factors are given serious consideration when determining whether a student is gifted. To account for the limitations of the tests, Louisiana allows an exception if students score between one and a half and two standard deviations above the mean on three separate tests: the IQ test and the standardized math and English exams. Then the district is advised to look at a student’s academic history for evidence of traits like problem solving ability and creativity. Despite this alternative, St. Charles still had trouble getting students at some of their schools into gifted programs. This doesn’t surprise Donna Ford, a professor in the special education department at Vanderbilt University’s Peabody College and an expert on diversity in gifted education. The Louisiana Department of Education did not respond to requests for a response to Ford’s assertion or comment on their gifted requirements. Stuck with the state’s gifted testing requirement, the district turned to a controversial premise: that giftedness can be nurtured in the right students, even if they don’t pass the test on the first or even second try. The experimental program, called Academic Academy, operates at the only four schools in the high-performing district in which white students are in the minority. In 2012, there were just 13 gifted students at these four campuses, less than 1 percent of the student body – a number in stark contrast to the statewide average of about 4 percent. This presented a problem for the gifted teachers at those schools. “With one or two kids [in the gifted program], students didn’t have access to the kind of meaningful discussions and exploration we hope comes out of these classes,” said Lisa DeJean, the gifted and talented technical assistant at St. Charles Parish Public Schools. The solution, the district decided, was to ask the state to waive the requirement that only students who met the test score cutoffs could be taught in gifted classrooms. The district hoped this would not only give the gifted classrooms a critical mass of students, but also increase the number and diversity of gifted students in those schools by exposing more students to the kind of thinking that the gifted tests attempt to measure. Meredith asks Cammon teachers to look beyond well-behaved, academically-oriented students when making recommendations for the Academic Academy. Near the end of each school year – before the state standardized test results are in – academy teachers give regular education teachers a list of traits to look for in a potentially gifted student, to include characteristics such as being highly imaginative, highly opinionated, being able to speak persuasively and having a good sense of humor. 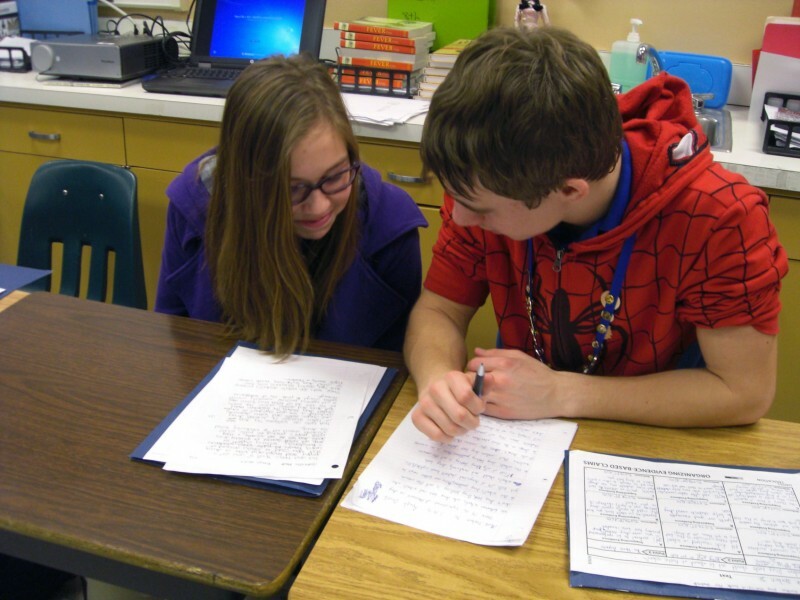 Last year, the Academic Academy program invited 91 students in second through eighth grades, who hadn’t made the requisite scores to be considered gifted, into the accelerated classrooms at the four schools. At the end of the year, the students were tested – again – for evidence of “giftedness.” Of the 91 students, six minority students and one white student attained the coveted status. At last count, three of the four schools participating in the Academic Academy had increased the number of gifted students of color, who made up over half of the gifted students at each school. On average, however, the schools continued to have a smaller percentage of gifted students than the state as a whole. For that to change, Vanderbilt professor Ford says more policies need to be amended. Ford says that an October open letter from the U.S. Department of Education’s Office for Civil Rights puts districts on notice that the department is intent on identifying and addressing discriminatory practices, both intentional and inadvertent, in gifted placements. But identifying discriminatory practices is only the beginning. Finding a remedy is the hard part. Districts have tried – and failed – to open the doors of their gifted classrooms to more minority students. In 2006, New York City decided to address its stubborn gifted gap. The district opened new accelerated programs in majority black and Hispanic neighborhoods and moved to centralize gifted admissions decisions. The system, in which all students would be evaluated using the same tests, was an effort to cut down on the possibility of racial bias. In response, well-off parents put their 4-year-olds into test prep programs — and the gifted program in the city became even whiter. By 2012, the city began shuttering gifted programs in black and Hispanic neighborhoods. Many states and districts have backed away from the test-only approach used in Louisiana and New York City. In Alabama, for example, the state requires districts to use a number of factors – including whether a student exhibits gifted characteristics like asking in-depth questions – when evaluating giftedness. The change was prompted by an investigation by the Office for Civil Rights; before the investigation, the only route into the gifted classroom required students to score at least a 130 on an IQ test. The National Association for Gifted Children (NAGC) sees merit in using IQ tests but argues such use should be part of a broader evaluation. Chester Finn, Jr., President Emeritus at the Thomas B. Fordham Foundation, a conservative think tank, and a former Assistant Secretary of Education in the Reagan Administration, understands why many districts stick with the testing model but thinks policies need to be flexible. “Public schools have to make difficult sorting decisions all the time,” said Finn. Finn said that local administrators should decide what approach to take for admitting students into accelerated programs. That way, districts like St. Charles could have alternative ways to evaluate students at schools that have a hard time filling their gifted programs. Louisiana is one of only eight states in which gifted requirements are set entirely by state regulations. 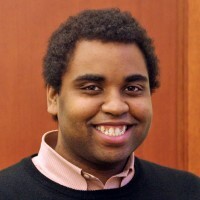 Vanderbilt’s Ford also argues for greater local control, and points to districts that have increased diversity in gifted programs by lowering requirements for students receiving free or reduced-price lunch, using it as a socio-economic indicator. As for St. Charles’s strategy, the district is hoping that if high potential students, particularly high potential minority students, are exposed to the kinds of ideas and discussions that their more affluent peers get at home they will be able to pass Louisiana’s mandated tests. 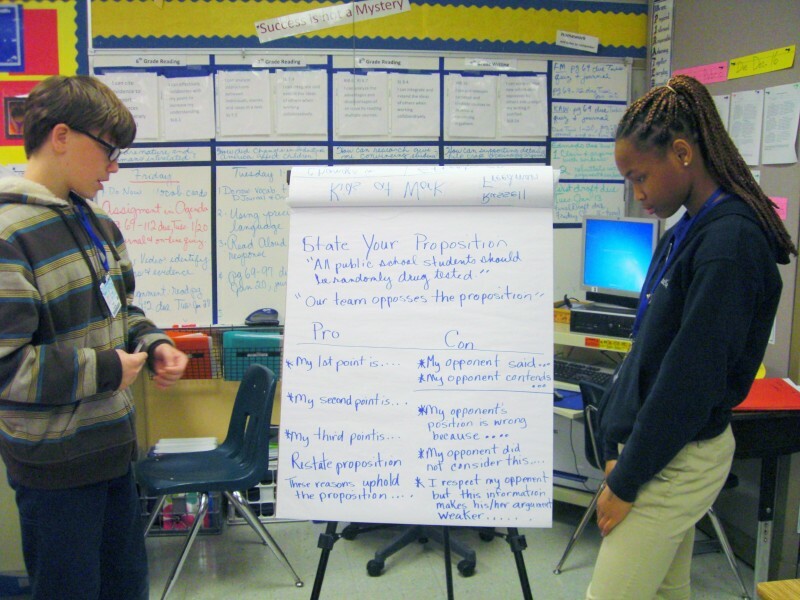 Over at Cammon Middle School, Meredith thinks the best ways to expose her students to that “different way of thinking” is through self-directed projects and class debates. While all of Cammon’s eighth-graders were assigned Inside Out and Back Again, a verse novel following the journey of a Vietnamese girl and her family from war-torn Vietnam to Alabama, Meredith also had her students independently research contemporary Vietnam, hence the classroom debate over outsourcing. 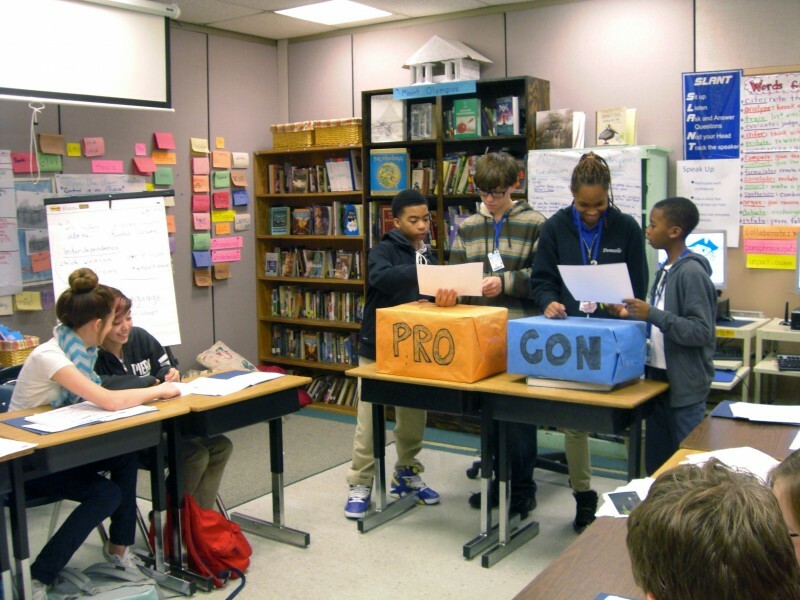 While only some of Meredith’s students want to join the academy debate team – which Meredith and Cammon principal Tamika Green proudly boast beat out several all-gifted debate teams from the district’s more affluent middle schools – all of her students seemed excited about the class’s projects. Angelina Wood proudly points out her replica of Mount Olympus, which also functions as a holocaust memorial. “That was another great project,” interjected Kai Hart. And when Keva Peters learned how much his dad, who served in Afghanistan, depended on service dogs to find bombs, he made a website about the history of military working dogs. “Even the Greeks and Romans had military dogs,” he recalled. Kai Hart, a budding entrepreneur, also built a website, this one to sell a line of tee shirts under the label, K.A.I. – Kids Are Immature. DeJean, who coordinates the Academic Academy program, and Green think the academy has been a good thing for the entire school, in part because accelerated classes are only offered in math and English language arts. While the program’s stated mission is to increase the number of gifted minority students in four schools, the folks at Cammon have a wider view of success. While Meredith agrees, she knows that her students are disappointed when they aren’t identified as gifted. This story was produced by The Hechinger Report, a nonprofit, independent news website focused on inequality and innovation in education. Read more about educational issues in the New Orleans area.